Adolfo Suárez Madrid-Barajas Airport, situated within the city limits of Madrid, is the gateway to the Iberian Peninsula from the rest of Europe and the world. Alternatively known by its former name of Madrid-Barajas Airport, it is one of the largest airports in the world, stretching over 3,050 hectares. Adolfo Suárez Madrid-Barajas Airport (IATA code: MAD) is Spain’s busiest international airport and the hub for Iberia and Air Europa. Flights to Madrid-Barajas Airport are provided by international airlines such as British Airways, Turkish Airlines and Lufthansa. MAD is a 20-minute drive from the city centre of Madrid. Book your cheap flights to and from Adolfo Suárez Madrid-Barajas Airport online! Adolfo Suárez Madrid-Barajas Airport provides tourists with one of the main entry points into Spain. Its easy access to the heart of the city provides the ideal opportunity to explore this historic country’s famous capital. Madrid-Barajas Airport opened to national and international air traffic in 1931, originally constructed to welcome a maximum of 30,000 passengers a year with one small terminal. Thanks to Spain hosting the 1982 FIFA World Cup, Adolfo Suárez Madrid-Barajas Airport experienced greater expansion and modernisation of its terminals. In 2016, the airport’s five terminals welcomed 50.4 million passengers through its doors. 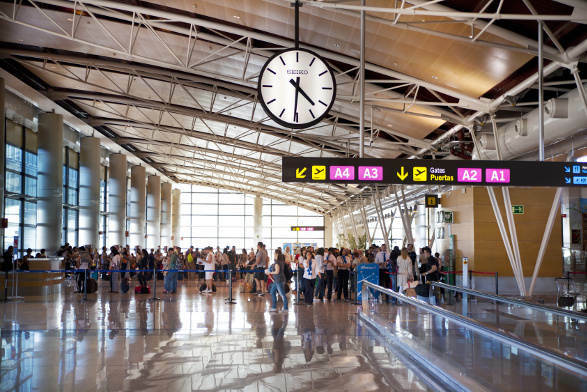 If you have some time to spare or you’re in need of some essentials for your trip to Madrid, visit a large number of retail outlets at Adolfo Suárez Madrid-Barajas Airport. Including duty-free shops, these various establishments sell products such as snacks, sportswear and sports gear, medication, jewellery, music, electronics, toys and games for kids, gifts and décor. Make sure to follow the baggage requirements at Madrid-Barajas Airport. With all the shopping you can do at Madrid’s hub airport, you will surely have built up an appetite! Satisfy yourself with the variety of meal options at the many eateries situated around the airport, which include fast food outlets, cafés, takeaways and restaurants. Adolfo Suárez Madrid-Barajas Airport features several luxurious VIP lounges, some with views over the air strip. They are situated in Terminals T1, T2, T3, T4 and T4S. Take note that the Neptune Lounge on the T4S terminal and the Cibeles Lounge on the T1 Terminal are reserved for non-Schengen flights. The Main Square Lounge on the T4 Terminal is reserved for Schengen flights, while the Puerta de Alcalá Lounge on the T2 Terminal is reserved for domestic and Schengen flights. Madrid-Barajas Airport includes free Wi-Fi, as well as internet access stations in Terminals T1, T2 and T3 (some of these points have free printers and chargers for all your devices). Other facilities include public phones, medical services, VIP services, business facilities, banks, ATMs, currency exchange offices, chapels, prayer rooms, a children’s area, a nursery and unaccompanied minors’ rooms. Regina This luxurious 3-star hotel, situated near Plaza Mayor, is a 30-minute drive or a 35-minute train ride from Adolfo Suárez Madrid-Barajas Airport. Amenities included at this establishment are an airport shuttle, a business centre, air conditioning, laundry service, a restaurant and a bar/lounge. Free Wi-Fi is available as well. TRYP Madrid Alameda Aeropuerto Hotel This lovely 4-star hotel is a 5-minute drive from Madrid-Barajas Airport. Its many amenities include breakfast, a 24-hour fitness centre, a business centre, a 24-hour front desk, air conditioning, a restaurant and a bar/lounge. Free airport shuttles as well as free Wi-Fi are also available. Eurostars Madrid Tower This towering 5-star luxury hotel is a 15-minute drive from Madrid’s airport. It boasts numerous amenities, such as childcare services, a full-service spa, a 24-hour health club, a 24-hour business centre, an airport shuttle, air conditioning, a restaurant and a bar/lounge. Free Wi-Fi is available as well. If you plan to order any foreign exchange, it has to be done 60 days before your collection date. You can only collect this order in person. Make sure to have the following documents when ordering foreign exchange. Exact Change and Global Exchange offices are available in all the terminals. The Madrid-Barajas Airport features a multi-storey parking area for short and long stays. Some of them are within walking distance of the terminals and others feature a shuttle service to take passengers to the terminals. You can reserve a parking spot on the airport’s website. Adolfo Suárez Madrid-Barajas Airport is 15 km north-east from Madrid’s city centre. Metred taxis, trains, city buses, intercity buses, Uber and car rental options are available to get you from the airport to your destination.